Son of the Chief Minister of Porbandar and his fourth wife, at 13 he was married to Kasturba, who bore him four sons during his life-long marriage. He trained for the bar at University College, London and except for his allegiance to vegetarianism, he sought to become an English gentleman. In 1893 he joined a law firm in Natal, South Africa, where he encountered fierce race discrimination. 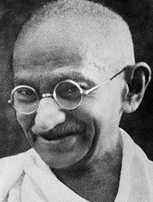 He encouraged the Indian population to adopt a policy of non-violent "Truth-Force" (satyagraha), based on the Hindu Bhagavad Gita and Jesus' teaching in The Sermon on the Mount. In India famous for his leadership in South Africa, he became recognized as a spiritual leader, involved in discrimination against Untouchables and the role of Indian women. During World War II he created the "Quit India" movement of civil disobedience to win Indian independence from the British Empire. In January 1948 to stop sectarian violence and the deportation of Moslems to Pakistan, he began a fast to the death. At the last moment the factions reached a peace agrrement and his fast was broken. Twelve days later he was shot by a disgruntled Hindu. PETER Your mother made a vow with a Jain priest that you should not stop being a vegetarian. GANDHI Mother believed intensely that animals had souls, which in fact some do, but not all. Thus if we were to eat an animal, we would be robbing them of part of their energetic being. This could contaminate our purity. Mother's vow alone did not influence me. I had to follow my own urgings. PETER You said, "The only people on Earth, who do not see Christ and his teachings as non-violent are Christians". Does the same problem relate to Hindus? PETER You taught yourself to spin and weave. You maintained silence one day a week. You ate very simply and walked a lot for exercise. What did you achieve by these practices? GANDHI I was able to go into deep meditative states, wherein I was able to communicate not only with my higher self, but with many of the Ascended Masters. These simple practices allowed me to obtain knowledge and feeling for all that has occurred on this planet. PETER What do you count as your greatest lifetime achievements? GANDHI I feel it was my example, letting people know that a single person - with the simplest experiences - can change the mindset at first of a few people, then of a larger group, then of whole sections of a country, and that sincerity and love can overcome antagonism and hatred. PETER You said, "The Truth is far more powerful than any weapon of mass destruction." GANDHI On Earth a person's truth changes as his perception changes. If someone kills your dearly beloved, your truth may change from pacifism to revenge. But if you are fully in touch with your soul, you know that your dearly beloved had an agreement to transition. In this situation, the soul does not judge but remains in unconditional love and thanks both souls for contributing to their spiritual growth. The soul has the fragment, the part of God that connects all of us. So it is the energy of God that allows this to occur. PETER You said, "I am a Christian, a Muslim, a Buddhist, and a Jew." GANDHI Each religion I immersed myself in had very good wisdom on how we should live a human life. One must allow those precepts which resonate to become a part of one, and allow that energy to be internalized in one's very being. Toni comments: Gandhi had a tender forcefulness to him. It was like talking with a very pious person, who was also a well-briefed attorney. The overall feeling was of peaceful loving-kindness. There was an under-statement in his words, directing our thinking to dwell on a path of wisdom and then letting us draw our own conclusions. The foregoing are excerpts from Talking with Leaders from the Past. If you wish to learn more please go to these websites Messages from the Masters and The Masters' Blog.